Today is such an exciting day for me. I can reveal one of my secret projects! 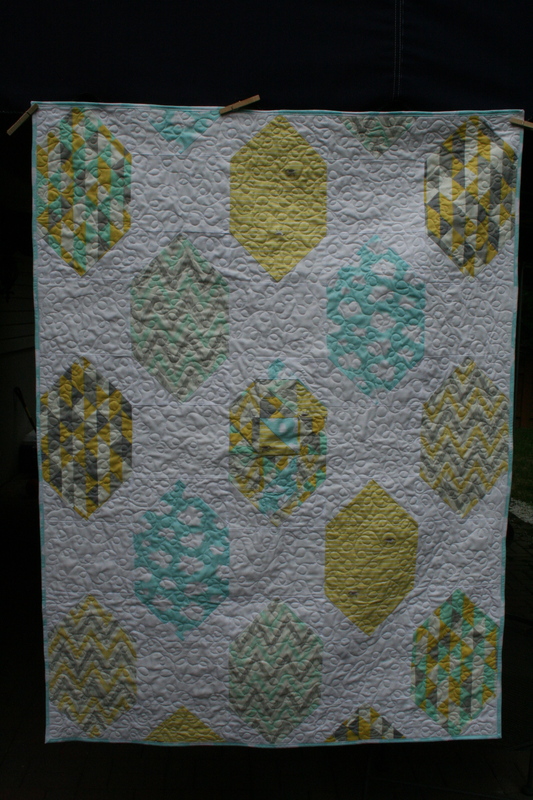 Introducing Spaced Out, a quilt I made for Cloud9 Fabrics to show off some of their gorgeous reprints (all organic! )– Sandpiper, Blue Yonder, On Point and Chevron, both in Minty and Golden. It’s called Spaced Out because the shapes have lots of room to breathe, but also because the gentle summery colors and the prints remind me of a day at the beach happily staring at the clouds, spacing out. The pattern is now available online free! It’s fat quarter-friendly and comes together quickly. It’s a great pattern for beginners because of big blocks and interesting, simple shapes, but it’s also fun for more advanced quilters who want to show off in the negative space. I like how the elongated hexagons can show off bigger prints and there is the option to piece blocks if you like tiny bits. I used the triangles trimmed from the corners to make a scrappy block for the center. Let me know if you make something with the pattern! I’m so happy for the opportunity to share it. It’s so cool and refreshing! I love the triangles leading in and going off to the bottom…like it’s going to keep rolling through with the pattern. The binding looks like poofy clouds on blue. I just love lurking on here. So much purty! The quilt is a beautiful stage for those fabrics. Very proud of my designer daughter!